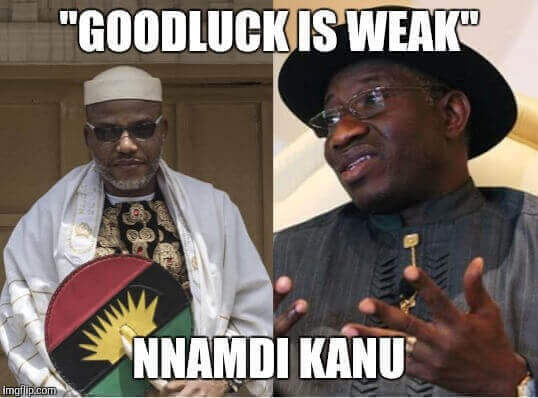 It seems the leader of the Indigenous people of Biafra IPOB Nnamdi Kanu has stepped on more toes, after he made comments that caused critics to warn him off. In his typically outspoken way, Kanu, during an interview with the SUN, he called the former Nigerian president Goodluck Jonathan a weak and incompetent leader. He went further to state that Gej's wife, Patience, would have done a better job if she had been President instead of her husband. His derogatory comments caused a ripple amongst certain groups of Nigerians. The Ogbia Brotherhood Youth Council (OBYC), in a clipped and precisely worded statement asked Kanu to cease from disrespecting the former president in his bid to makes his case heard for the creation of Biafra. Addressing the IPOB leader's statements, the National President of OBYC, Dr. Laguo Gilbert, described Kanu's remarks as unfortunate and asked the general public to disregard it completely. "Bringing former President Goodluck Jonathan into this issues in such a disrespectful manner will neither help nor give credence to its rancour. OBYC therefore warns Nnamdi Kanu to desist forthwith from linking a man of honor like Dr. Jonathan into his directionless agitation. Such radical statements remain one of the reasons why the IPOB agitation lacks its required substance. The OBYC however advises Mr. Kanu to learn from the mistakes made by the group in the past and its predecessor, as this will be necessary to implement its vision"
Kanu's bold and daring critism of prominent individuals and groups is something the the Biafran movement's leader is well known for.